Friday, December 1, 7-9 p.m.
Friday, December 1, Saturday, December 2, Friday, December 8, Saturday, December 9, Friday, December 15, Saturday, December 16, Friday, December 22, Saturday, December 23: 5-9 p.m.
Owen Farm Winterfest is holiday fun for the entire family! Come enjoy a hayride to see Santa, activities in the Loft for the children, roast s'mores, enjoy hot cider, hot chocolate, hot dogs, ribbon fries and more. Hayride cost is $8 for all ages, kids receive a treat from Santa (under 2 is free). Night time hayrides will take place Dec. 1, 2, 8, 9, 15, 16, 22 and 23 from 5-8:30 p.m.
Cookie decorating, ornament making, coloring station are an additional $3.50 for all inclusive activities... if done individually the cost is $2 each. We also have fresh cut Frasier Fir Christmas Trees for sale, ranging from 5-11 ft.
Friday, December 1, 7-10 p.m. Celebrate the Christmas season at the annual Christmas concert held by the Dan River Region Bluegrass Association! Bluegrass & Gospel music followed by fellowship and food for all the attendees! Plan to come early because it usually sells out! Saturday, December 2, 8 a.m.-2 p.m.
Our First Annual Christmas Bazaar, featuring local crafters, artisans, bakers, food vendors, music, hot cider, hot cocoa and specialty items, will be held in our indoor conference center. The FFA Christmas tree sale will also be onsite, as well as the DKC Agility Trials Dog Show in our arena. Come join in the festivities, shop for unique gifts and get ready for the holidays! Saturday, December 2: 10 a.m.-12 p.m., 4-6 p.m.
Saturday, December 9: 10 a.m.-12 p.m., 4-6 p.m. The holidays are fast approaching and we are close to our first Polar Express Pajama Party! Put on your favorite pajamas and enjoy this holiday classic in our digital dome theater. Tickets are $15 ($12 for members) and include movie ticket, family photo and admission to the Danville Science Center that day. Snacks and drinks will also be available for purchase. Saturday, December 2, 1-2 p.m. The annual Chatham Christmas Parade will take place on Saturday, December 2nd, at 1 p.m. and will follow the parade route along Main Street from Hurt Street to Depot Street. Join us and enjoy the marching bands, school groups, community organizations, churches and others in celebrating the Christmas season! Take a tour of all the new businesses in town, both before and after the parade, to get a jump on your shopping list! From beauty products at Studio 29 to local art and food items at Reid Street Gallery, you’ll find something for everyone on your list! Saturday, December 2, 4-8 p.m. The Homeplace Vineyard will have a Christmas Open House on December 2nd from 4-8 p.m. Music will be by Nobody's Business, playing some jazzy tunes along with your favorite Christmas songs. Refreshments will be provided as a thank you to our guests for your support over the past year. Our Christmas present to our guests this year is our release of the long awaited Cabernet Franc. It is oh so delicious! Please join us for this special evening! Saturday, December 2, 4-6 p.m. The River District Association invites you to join us for the official lighting of the Main Street Plaza, hot chocolate, cookies, selfies with Santa and Mrs. Claus and performances by local musicians and school groups. Bring a new, unwrapped toy for the Salvation Army and be entered into a drawing to win free tickets to the River District on Ice skating rink. Visit the Danville Community Market for a special Holiday Market featuring everything you need to get ready for your holiday parties and gatherings!! The 2017 Holiday Market will offer live locally grown Christmas trees, baked goods, wreaths, jewelry, artwork and other unique gifts. We will also have the Annual Breakfast with Santa from 9 a.m.-11 a.m. Enjoy pancakes, pictures and visits with Santa! Saturday, December 2, 6-8 p.m.
Join Danville Parks and Recreation for its annual Luminaria Trail Walk along the Dan River from Main Street Plaza to The Crossing. Luminaries will show you the way while carolers will add a little magic to your walk. Enjoy a warm hot chocolate and holiday treat on us. 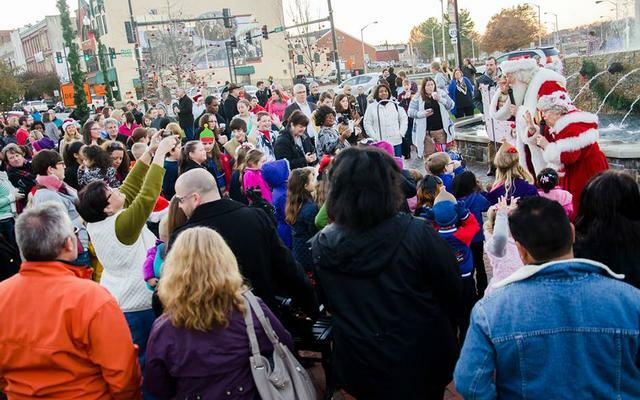 This event is free and will follow River District Association's tree lighting on the Plaza. The ice rink will also be open at the Crossing. Saturday, December 2-Tuesday, January 2: Monday-Friday from 5-9 p.m. and Saturday-Sunday from 12-9 p.m. The River District Association, in partnership with the City of Danville Parks and Recreation and the Danville Regional Foundation, will bring a season of ice skating to the River District this year! We aim to provide a fun activity for all to enjoy throughout the month of December. River District on Ice will open on Saturday, December 2nd and remain open through January 2nd, 2018. Hours of operation will be Monday-Friday from 5-9 p.m. and Saturday & Sunday from 12-9 p.m. The synthetic ice skating rink will be located in the back parking lot at the Community Market. Cost to skate is $2 per person, cash only, for a 20-minute session; ice skate rental is included in the cost. Participants under 18 years of age must be accompanied by a parent or guardian. Sunday, December 3, 3-5 p.m. The Annual Danville Riverview Rotary Christmas Parade is a fun way to spread the Joy of Christmas! This year's theme is "Peace on Earth." For more information, contact the Danville Welcome Center. Sunday, December 3, 5-6 p.m.
Hurt’s second annual Christmas Tree Lighting will be held at Roosevelt Mattox Park (adjacent to Town Hall) on Sunday, December 3 at 5 p.m.
New Prospect Baptist Church children’s choir and the Hurt Elementary School Chorus, Jammers, and Flaggers are scheduled to provide a variety of holiday music as the town’s new Norway spruce is illuminated. Sunday, December 3, 7:30 p.m.
Chatham Concert Series, Holiday Favorites Concert, with David Stewart Riley, pianist and conductor of the Roanoke Symphony Orchestra, and Kevin and Bryan Matheson on strings. Tuesday, December 5, 4:30-6:30 p.m.
Ready to get in the holiday spirit? Come to the Institute for Advanced Learning and Research to view over 50 decorated trees! Help us support local causes and charities by making monetary donations for your favorite tree! Thursday, December 7, 6-8 p.m.
From the people who brought you Yappy Hour and Barktober Fest comes an entirely new Christmas event! "Bark The Halls" will take place on the light-testing night of The Community Holiday Light Show and is your opportunity to walk through the lights with your pet. Enjoy live music, hot cocoa, crafts and FREE pictures with Santa. Enter your dog into the Tacky Christmas Sweater contest to win a prize! Dogs must be registered by 6:45 p.m. and the contest will begin at 7 p.m. Admission is free, but dog product donations are encouraged (dog food, toys, water bowls, etc.). Saturday, December 9, 12-10 p.m.
Bring your Hawaiian shirts, leis, and grass skirts because Ballad Brewing is ready to celebrate the holidays like we were all transported to the tropics. Live Music, a brand new Tropical Vacay IPA, food, fun and more. A Tropical Claus/Hawaiian T-Shirt Contest will be held for prizes. Extra points for Mrs. Tropical Claus, elves or classic tropical pop culture icons. Music by Shiloh Hill and Food by Backporch BBQ. Saturday, December 9, 1-3:30 p.m.
“Janie’s Christmas” 2017 is a special Holiday Tour of the Sutherlin Mansion, as seen through the eyes of 9-year-old Janie Sutherlin, (affectionately known as Janie 2) during the Christmas of 1859/1860. Guided through period vignettes, visitors will complete the event with the Christmas of 1881 and that Victorian winter in the life of 9-year-old Janie Sutherlin Smith, (also known as Janie 3). Tours are on the half-hour and rotate until the last tour, which begins at 3 p.m. Tours last approximately 1.5 hours. You must call to reserve your tour time at the Museum (434)793-5644. The Museum is taking reservations on a first-come first-served basis. Tour groups are limited to 15 people per group. The frist tour begins promptly at 1 p.m., second tour at 1:30 p.m., third tour at 2 p.m., fourth tour at 2:30 p.m., and final tour begins at 3 p.m. This event is free to the public, but you must call to reserve your spot on the tour. Drive through Ballou Park this December as holiday lights fill atmosphere. The show is made up entirely of displays created by the community. Over 9,600 people attended in 2016 in 2,517 cars and 18 buses and this year promises to be even better. Registered non-profits will be eligible to receive prize money for the “Best in Show” award. Monetary prizes will be awarded for first through fourth place. This year’s show will be limited to the first 40 displays. The Children’s Village, which is included in the price of admission, will be open through December 23 until 9 p.m. Join us for free photos with Santa, holiday crafts and hot chocolate. Admission fee: $7 cars, $15 van and mini-buses. Show is closed on Christmas Eve. Saturday, December 9, 8-10 p.m. The concert is free to public. We are asking to bring two or more of non-perishable canned food and/or monetary donation for God's Storehouse. We will be collecting donations at the entrance. Farandole from L’Arlesienne – Bizet, Three Selections from Nutcracker – Tchaikovsky, Santa’s Reindeer Team – Milholland, - David “Hutch” Hutchinson, Narrator, Festive Sounds of Hanukah - Arr. Holcombe, Sleigh Ride – Anderson, Bugler’s Holiday - Anderson, Feliz Navidad - Rican & Feliciano, A Christmas Song - Torme, Still, Still, Still - Luboff, White Christmas - Berlin, - Quartet: Susanne Martin, Charlotte Litzenberg, Joe Northern, Raul Wes, Charlie Brown Christmas, and more . .
Sunday, December 10, 1-5 p.m.
View the past to see the future! See how old houses and buildings have been renovated and repurposed. *On tour dates, tickets sold here for $25. Sunday, December 10, 4:30-5:30 p.m.
Join us for the 2017 Gretna Christmas Parade! Lots of fun for all – fire trucks, floats, music and, of course, SANTA!! Saturday, December 16, 10 a.m.-1 p.m.
Join us for storytime, holiday activities and hot chocolate. Local authors will read to children from their original works. Saturday, December 23, 7-11 p.m. Pick out your ugliest sweater and join us at 2 Witches for our 4th Annual Ugly Sweater Party! This is a great time to catch up with old friends and make some new ones! DJ Drake will be spinning the tunes so everyone can get their Jolly ON! Back Porch BBQ will also be on-site serving their delicious food! Please view our Facebook Events Tab for updated class information.